-Connecticut. I think this one is about to set a record for consecutive times being included as one of the choices without ever winning but certainly with the open seat situation we'll be interested in taking a look there eventually. -Hawaii. As I said last week I don't think Linda Lingle left office all that popular so I don't think she'd be a particularly great threat to Daniel Akaka but we're more than happy to take a look at it if you want us to. -Maine. I've been holding off on giving this as an option while waiting to see if even a 'medium' name would challenge Olympia Snowe from the right- I don't know that there's really the possibility of a 'big name-' but with today's announcement I think we probably have whoever we're going to have at this point so we can at least get a measure of where it starts out. My guess is that Snowe's ahead of named challengers at this point because they're so obscure but that hardly means she's out of the water. -New Hampshire. One of the closer Presidential states we haven't taken a look at yet and I guess we can tell you for the forty millionth time that Mitt Romney's in the 30s and no one else is out of the 10s for the Republican primary, although I guess if we finally found a story different than that it would be noteworthy. -Rhode Island. There's really only one thing interesting here and that's to see if Don Carcieri would be competitive with Sheldon Whitehouse. I'm guessing nyet. -Washington. As we've said before, if we poll this one, we're only going to do President and Senate. I think Maria Cantwell is probably the most potentially vulnerable of the Democratic Senators we haven't polled on yet but that's mostly just because we have polled on almost all of them already. Hard to imagine that if Patty Murray survived 2010 that Maria Cantwell wouldn't survive 2012. Voting is open until Monday night. As always, don't stuff the ballot box. If the candidate field really starts to become clear in Virginia and/or Arizona over the next couple weeks we'll consider going ahead and polling one of those places but otherwise I think we're going to wait until March before polling any state for the second time. Why won't you poll WA-GOV? It doesn't fit your narrative if McKenna leads? If New Hampshire wins this, PLEASE test Rudy Giuliani in the Republican primary. In the light of CPAC, it might even be worth testing Donald Trump. Shouldn't you be polling the WA Govs race as well? Gregworie is stepping down and Dem Rep. Inslee and the GOP AG are already sniping at each other. I suppose it isn't worth looking at the congressional districts since those are about to be changed, but maybe testing some of the GOP members for Gov. as well? This time really good list of states for poll. I would see happy every one of these states. I would like you include WA-Gov too, but it seems not possible. Why WA-Gov can not be polled? You poll WV-Gov and MO-Gov at the same time than the senate and presidential races. If you end up polling Maine (I voted for New Hampshire simply for the Obama v. R results), I gather that you'll test both of the current U.S. Representatives against Snowe? For Maine, you could do generic candidate questions if it wins. Ex: Snowe vs Tea Party Republican (for primary), generic Democrat vs Snowe and generic Tea Partier. NEW HAMPSHIRE HAS TO BE POLLED. 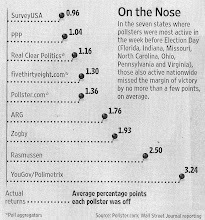 IT IS THE LAST SWING STATE YET TO BE POLLED THAT OBAMA WON IN 2008. COME ON! IT SHOULDNT BE A POLL. YOU HAVE TO POLL NEW HAMPSHIRE FOR THE PRESIDENTIAL ELECTION, ESPECIALLY INTERESTED TO SEE ROMNEY VS. OBAMA IN NH! I would include Oregon in the list before Rhode Island as example. Sheldon Whitehouse will not retire and is safe. Oregon is closer toa swing state. I'll say New Hampshire. Give Maine another week to see if anything happens in the primary situation on the right and let the news circulate about the primary challenger. New Hampshire has a relatively settled situation, by contrast. Out of the states in the poll, will you poll only the winner or the top-2 states ? I say go for Maine. Poll Collins, too. The numbers are very good for Obama, coming from a Republican pollster. Magellan Stategies also did really well in the NH GOP primary last year. Like PPP, they showed Lamontagne gaining in the last couple days before the primary and then got the margin right. Now I'd like to see what you guys from PPP will find in the state. Therefore I voted for New Hampshire. Who did win the poll about the bonus Republican ? Maine. I'd disagree with the commenter above who said to do "generic tea partier" against Snowe, since you've already done that, but you seemed to say you're planning on Dodge and D'Ambroise anyway. Given the CPAC press, Dodge probably has more recognition than D'Ambroise starting out, though Dodge has already made clear he is neither a social con nor a Paulist, which could give D'Ambroise an opening down the line. Also, if you do poll the general, could you mention Rosa Scarcelli for the Democrats? She indicated she would run if Snowe was primaried. Chellie Pingree apparantly ruled herself out. The republican primary with Snowe and LePage. The democratic primary with and without Snowe. It is a lot less interesting to see Scarcelli. If Snowe retires we should see higher profile democrats running for this seat. I'm from CT so I've noticed/lamented that our state never gets chosen in these polls, HOWEVER I hope Rhode Island is chosen this week: gay marriage is a big issue there right now and is currently being worked on in the state legislature, so that's a question I would definitely like to see included in a RI poll. Voted for Maine. As Democrats in Maine, I think Michaud and Scarcelli are the obvious choices. Also, if it doesn't make the poll too long, do you think you could test Snowe as an independent in the general in case she tries to pull a Crist/Murkowski? Please poll Rhode Island and also ask about marriage equality. That debate is heating up there and NOM is pushing poll numbers that seem bogus. Poll Whitehouse vs. Carcieri in Rhode Island, simply because no one out there has polled this matchup yet. Also, how about taking another look now that Arizona is in play? Flake and Franks on the Republican side versus Giffords and Napolitano for the Democrats? Will you poll Eliott Cutler as an Independent in Maine ? He did reasonably well last year. Here's hoping the Tea Party nuts knock off Snowe so she can be replaced by the liberal Senator that Maine deserves. And please nominate a real liberal Senator because any Tea Party loon that beats Snowe in a primary will be an easy target so you might as well go for it with a real Democrat! Also I agree that I would love to see Donald Trump included... but only because I think he would get beaten so badly (by Obama) that it would be funny. To the commentators suggesting LePage vs Snowe, it would never happen, as LePage has already endorsed Snowe. It may be interesting to ask how LaPage's endorsement of Snowe affects the primary voters votes, however. If Snowe switch to democrat... Snowe (D) vs LePage (R) would be pretty possible. Paul LePage it is key for know the level what can take a high profile teabagger in a poll for ME-Sen.
Where should we poll this coming weekend?